"Now in Delicious Candy Flavours!" Revolution Nutrition™ BCAA Splash Energy™ packs all the key ingredients of the famous BCAA Splash™ all in delicious CANDY FLAVORS!! The BCAAs represent at least 30% of muscle tissue composition. 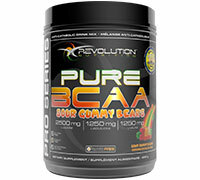 Multiple studies show that exercise ignites excretion and degradation of the BCAAs contained in the muscles. Providing your body with sufficient amount of BCAAs during and after exercise has an important anti-catabolic effect and supports lean muscle growth. Mix one teaspoon in your favorite beverage and drink it throughout your workout. For maximum results, drink one serving during your workout and another immediately following your training. You can use up to three servings daily. © 2019 Supplements Canada.com All Rights Reserved. **The products and the claims made about specific products on or through this site have not been evaluated by SupplementsCanada.com or Health Canada and are not approved to diagnose, treat, cure or prevent disease. The information provided on this site is for informational purposes only and is not intended as a substitute for advice from your physician or other health care professional or any information contained on or in any product label or packaging. You should consult with a healthcare professional before starting any diet, exercise or supplementation program, before taking any medication, or if you have or suspect you might have a health problem. Information about each product is taken from the labels of the products or from the manufacturer's advertising material. 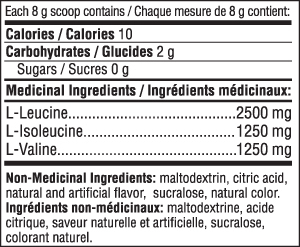 SupplementsCanada.com is not responsible for any statements or claims that various manufacturers make about their products. We cannot be held responsible for typographical errors or product formulation changes. Sport supplementation should be used by persons 18 years and older.